The movie had 2 music directors. The first Music Director was N.S.Balakrishnan, he tuned for three songs the first song that is the title song of the movie "Senthamizhe vanakkam", MGR & Bhanumathy song "Sammadhama" and third one MGR, Bhanumathy and Chandra combination "Padupatta Thannaley". Due to unavoildable circumstances N.S.Balakrishnan resigned from the project. S.M.Subbiah Naidu took the mantle and composed the remaining songs and back ground music. Cameraman Ramu was well versed in shooting in Black and white. When MGR planned to take the remainig portion in colour, Ramu requested to use some one as the cameraman. After knowing his hesitation MGR asked to go ahead but Ramu told that he dont know the technical side that his best friend who is well versed in colour shoot did not give any idea which his friend promised earlier. Those days the colour films are processed in Bombay (Mumbai) only. MGR asked him to go ahead with a test shoot, and dont worry about the budget. If test shoot is successful go ahead with shooting with colour film if it is not success they planned to start again with black and white, actress from MGR Nadaga mandram acted for the test. After processing the film the lab gave that no adjustment is needed it is professional looking. Then Ramu went on with outdoor shooting in Munnar . That is what we see now. The role of Princess Rathna was acted earlier by one artist, which MGR was not satisfied with her performance. Earlier Saroja Devi was casted in the role of Queens Maid , who spies as per MGR's wish. And Saroja Devi acted in the song "Padupatta Thannaley". After casting her in Rathna role, Chandra was included in the cast as maid and shooting again for the song. MGR has spent more on re shooting due to technical reasons. 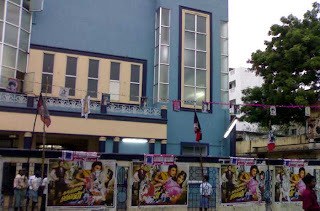 Nadodi Mannan movie was released in Chennai in three theatres. All the three theatres were 100 days, the highest in Chennai run is 161 days. The movie was released in Tamilnadu in more than 160 centres. 100 days theatre 28, 75 days theatre 67, 50 days theatre 157. In Srilanka the highest run is 140 days, and in Banglore it is 105 days. In those days Ayirathil Oruvan was released in touring talkies also. Now in modern time the movie was re-released in DTS theatres that was history, now Ayirathil Oruvan has reached multiplex. For the first time in the history of Tamil cinema 43 year old movie was re-released in Mayajaal in Chennai. The response was tremendous. Above is the ad placed in Daily Thanthi Chennai edition. This is my experiment with 18 lakhs. This was said by MGR in 1958 after stupendous success of the Movie Nadodi Mannan. How humble he is. The movie was a revolutionary in tamil cinema. It had showed the movie world a new way of story telling a new way of film making, a new way of editing, a new way of techniques in double action scenes so on and so forth. I have taken some of the instances said by MGR in "Yaruku Vetri" way back in 1958, most of his writing in video format. MGR's education level is so poor but his writing skills is awesome when I read the Special edition by MGR Pictures. How well he knew and how clear his ideas are for instances the technical side, story side, dialogue side, music side, cinematography side, costume side, editing side and how he knew which actors to do which part etc. MGR is multi faceted that was proved if you watch Nadodi Mannan. We cannot put MGR into a position of mere actor alone. When he talks about the story part he says that I am not blind sided that Nadodi Mannan does not have any minus points and I am not that stupid, but I can say that it does not have more minus points. See how humbly he uses the words. MGR further goes into how the story was developed in the year 1937-38 he was in the shooting of Maya Machindra, in Calcutta (Kolkatta) one day he went with his friends to watch a Hollywood movie "If I were King" acted by Ronald Colman, one of the scene the Hero says If I become a King ... but MGR did not follow what the dialogues his mind was revolving around the words If I become a King. That is the day when Nadodi Mannan was seeded in his mind, it developed slowly when the time was ripe, MGR went on to produce the movie. Why did he produce then? Because he said it is an experiment so I did not want other producers to loose money if the film fails. 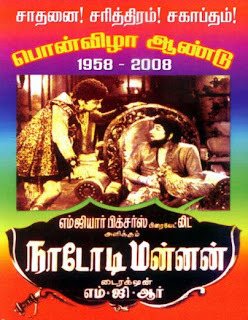 First the movie was named Uthamaputhiran with MGR and Nadigar Thilagam with same movie title. 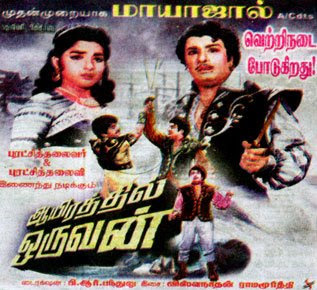 MGR then re christened the name into Nadodi Mannan with a hint on it is remake of Prisoner of Zenda at first. In the shooting of Alibaba actress Bhanumathy questioned MGR that she was also producing the same movie with the same story. She asked MGR to discontinue the movie, but MGR said politely that this story only had the King's character from the movie but the others are different. And that he has nurtured the story for years and he has the idea to direct also. She was hesitant at first, then after some days, Bhanumathy told that she has stopped the movie that you can now take the movie as you wish, MGR thanked her whole heartedly. (Can any one in the calibre of MGR can tell the truth like this). Here is the Intro for most important characters of the movie, starting with M.N.Nambiyar who is also has the right to become King, if you watched whole movie you will understand that MGR has given costly costumes to Nambiyar in this movie, and also that Nambiyar is good looking. Watch for the line of Nambiyar in this clip. Followed by most memorable song "Thoongathey thambi thoongathey" written by Pattukottai Kalyana Sundaram. Followed by the clip showing the camera angle the creativity of MGR and Ramu (Camera Man) imagining the point of view of Bhanumathy through the ventilator shaft. A great achievement of those days for camera angle. The intro of King MGR in a Chariot, look closely the intricate details of the chariot, it looks very royal. How much did MGR has spent for this chariot alone. When King and Wanderer starts the conversation about the kingdom and the condition of the poor people the dialogues shifts from the ability of the king and commons, both MGR will be sitting in arms distance, left side was King, right was Wanderer, camera was on the side of Wanderer now then the camera pans to the left for the conversation part of King. The movement part is small or tiny for the camera, you cannot see any jerk as we know both the characters are MGR. Such is the work of the camera man Ramu. Watch the eye movement of Wanderer when King speaks his condition and his plans. The conversation scene between King and Wanderer is good example for double action scenes, concentration should be on the technical side but remember the dialogues are also very well written and used by MGR, the dialogues are by Kannadasan and Ravindran a good balance between audio and visual. I added this clip to continue to show the brilliance, very simple technique but awesome to watch. Wanderer as King was speaking with the Queen enacted by M.N.Rajam. These characters standing near a big glass window. 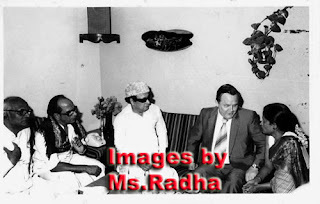 M.G.Chakrapani takes King MGR to show him that his wife is cheating King MGR. The camera shows Wanderer and Queen now the camera turns left to show the King entwined by his enemies. First it appeared to me two shots interconnected. I slowed the clip and watched frame by frame there was no jerk, here the distance between both MGR characters are more when compared to the above conversation scene between King and Wanderer. With second one I came to conclusion that Wanderer and Queen shot is back projection and the camera spins to King MGR side that is live character, watch the camera gets inside the set and you can see 3D view of King MGR side. I think this is one movie were MGR has spoken a lot of dialogues the dialogues are not lengthy which is supposed to be protocol for historical movies. The time was 1958 the dialogue was ruling the tamil movie world. Kannadasan who was also a D.M.K. and Ravindran is very close to MGR. Both the writers had one concept that worked well. 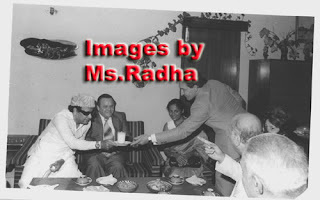 MGR had told that both of them belonged to same kind of principles that made MGR very easy going with them. In this clip I took the famous one liners, when Wanderer insists to give him powers to make law, both the Ministers look dumb struck watch now in a second three shots are joined. one shot prime minister looks to the side of Commander, second shot Commander looks to the side of Prime Minister and third the Prime Minister looking to MGR. I conclude that first and third shot are one shot and MGR used the last part of the first shot for third one. Remember the importance is for dialogues only but the visual is balanced evenly. I added this to glorify MGR because all the Actors in the world have proclaimed some heroic deeds but I feel MGR only had fulfilled what he said in the screen that he had done in his life. Look into the dialogue that he is giving away half of the property to the deaf and dumb. (Remember the Will of MGR in 1986). The other laws Wanderer as King proclaims are the one MGR done in his political career. I think MGR had some time travel mechanism that he knew what are going to be happen in the future. This one video clip is special that I have touched the cup used by MGR in this movie. Out of these two cups which one I took into my hands I don’t know. Both are looking same. I thank Jr.MGR Pradeep the opportunity to handle the precious glass the important thing which change the Wanderer to become the King. 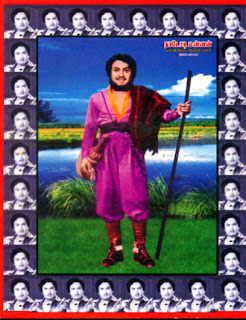 The 65 page Anniversary Issue "Urimal Kural MGR" Nadodi Mannan Pon Vizha Aandu 1958 to 2008, will be released by the end of August. It contains 4 colour images and 40+ black and white photos of MGR only. Here are the two colour images of the book. Subsequently the front cover will be posted in future post. The entire book contains all the records of Nadodi Mannan, not only the Box Office collection but also the finest details that are not known to the general public about the movie Nadodi Mannan. The Book also includes some of the extracts from "Yaruku Vetri" written by MGR in 1959. The interviews given by various artists who participated in Nadodi Mannan movie. The book also contains the re-release records of the movie in 1980s to till date and how well it fared in the Box Office. B.S.Raj has composed all these details in short span of three weeks. Let us pray for the success of this Anniversary issue. The movie Nadodi Mannan will be released soon in Chennai theatres. 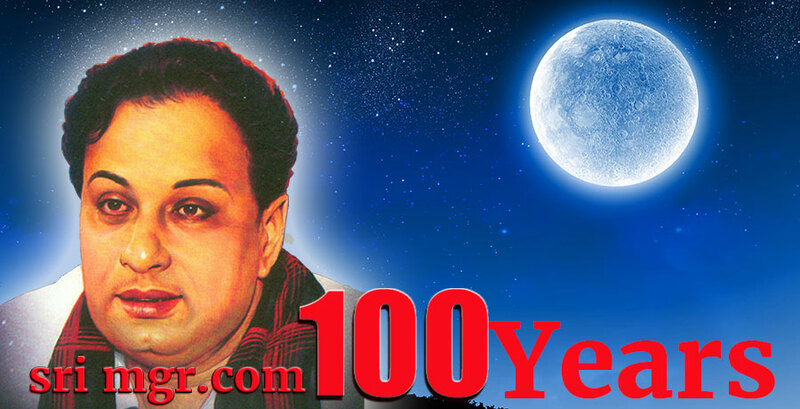 Only a week is left for the 50th Year of Nadodi Mannan. A special Book is being done by B.S.Raj. The book will be 65 page fully having the details of Nadodi Mannan, the records from 1958 and to the present day re-releases. Those who are reading this Blog and interested to write about Nadodi Mannan, can send their mail to replytomgr@live.in and write about the most liked scene in Nadodi Mannan, any interesting details about the movie which will be published in this Blog. Send the mail on or before 21st of August 2008. 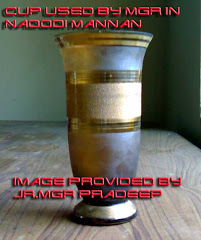 The video work on Nadodi Mannan is half finished. This image is taken from the video. For the year 1972, MGR Fans say it is Nalla Neram and Sivaji Fans say it is Vasantha Maligai, I don't have the full collection details of either Nalla Neram and Vasantha maligai. So I left it. MGR One liner to Jayalalitha. This clip contains the one liner of MGR from the movie Ayirathil Oruvan. MGR is a different Leader. When Jayalalitha gives permission to him to enter all the places in the Island and ready to give him good place to dwell, then MGR say, if my friends are also allowed to do the same I too will enjoy. And continues what a Leader should be (typical MGR one liner) – they believe me as their Head and I consider them as my Body, what is the use when Head is separated from the Body the life. Watch the fans applause when MGR utters the words. Here is the video clip of scene 2 of Ayirathil Oruvan. In this clip MGR gives treatment, the ship captain informs Ramadoss that he is a Leader to the Slaves, which brings panic for Ramadoss and orders MGR to be thrown to the Sea. But Jayalalitha interferes and gets permission to use the skills of a Doctor for the snake ridden Island. And also watch the enjoyment of the Fans when the words comes from Amma. Clip also includes the song “Ean endra kelvi” Fans became ecstatic for this whole song. Ayirathil Oruvan movie was re-released in Pandian Theatre. June third to July first week there was no re-release of MGR Movies. 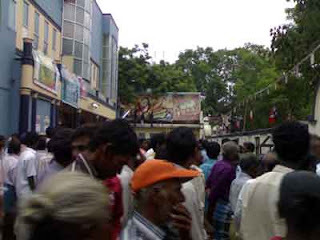 Due to the reason there was large number of MGR fans and devotees thronged Pandian theatre. The nearest theatre was screening Rajni's Kuselan. Response is higher when compared to Kuselan. And Kalaingar Karunanidhi movie Uliyin oosai was noon show and Ayirathil Oruvan 3 shows. The excitement of MGR Fans were overwhelming. 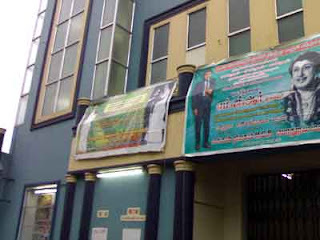 MGR pothunala mandram also placed placards and decorated with MGR photos. It looked like a festival. 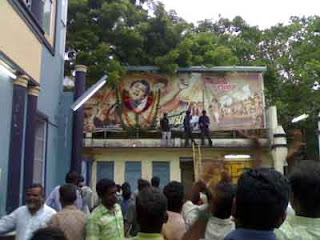 ADMK flag were hoisted around the theatre. The show was houseful, the crowd was so ecstatic, theatre management was over looking the Devotees respect to MGR by placing candles and lighting of camphor. The screen looked a temple. Their God was MGR. 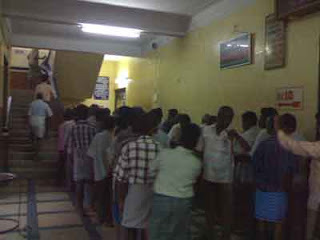 The capacity of the theatre is 1025 and the ticket rate are Rs.7, Rs.10 and Rs.12. Ticket price is cheapest in Pandian theatre. Watch the fans excitement, before that you cannot going to hear any film sound only the claps and merriment of MGR fans and Devotees. Many fans were enquiring us about the release of Ulagam Sutrum valiban and the 50th year of Nadodi Mannan. I received a mail from Madam Radha and she wanted to know about the details of MGR movie “Panakari” based on Leo Tolstoy’s novel “Anna Karenina.” I searched my entire collection, and called all my friends and Jr.MGR Pradeep. And found out that the movie “Panakari” was released in the year 1953 and MGR acted as anti hero. T.R.Rajakumari was the heroin. I found 4 images of this movie and all came from MGR Story and MGR Ninaivugal both published by Ithayakani Vijayan. I forwarded the images to her and she thanked me. 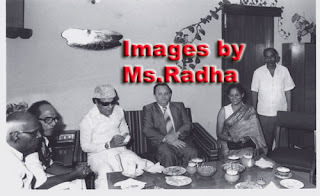 Madam Radha is of Indian origin and now she is living in the U.S. She searched for MGR movies on the internet and found our Blog and was very happy to see such thriving interest in MGR and his contribution. She has had the good fortune of having known MGR professionally and has met him a couple of times. On every one of those occasions she was impressed with MGR’s memory to remember people, his attentiveness to everyone who was present, his respect to the artists and his sense of humor. She is not a MGR Fan but she respect him deeply and consider him as a unique individual who gave a lot to the people he served and entertained. She mailed me four photos. They were taken in 1979/80. They offered some sweets with coffee and MadamRadha did not have any, MGR asked her, if she was trying to be careful about what she eats. That is why she is smiling. 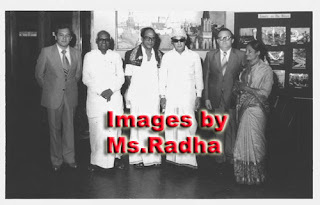 I thank Madam Radha for mailing me the photos and sharing her experience with MGR Fans through this Blog.